Need more apps for your favorite device? iOSnoops can help! Here are 58 iPhone and iPad apps that have just gone free. 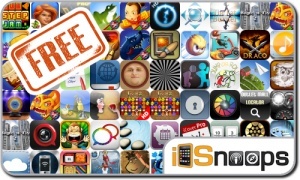 This apps gone free alert includes Fishdom H2O: Hidden Odyssey, Tap Reef 2, Sovereign: Kingdoms, Hector, Gemz, Draco The Dragon, Air Jump, Antique Blocks, Turbo Grannies, Rope’n’Fly 2, CinePro, Phone Drive, and many others.